The unrivaled champion of Android 9.0 updates strikes again today, dishing out official Pie goodies for an entry-level device released last year after very recently taking care of two older mid-rangers that actually came powered by the ancient Nougat flavor of Google's mobile OS back in 2017. 2018's Nokia 2.1 obviously launched with Android Oreo out the box, which doesn't make HMD Global's latest software support feat any less impressive. The exclusive Nokia brand licensee is bringing a fresh version of Android that other companies haven't been able to roll out for many high-end phones to a 5.5-inch handset packing a modest Snapdragon 425 processor and 1GB RAM. While the company's mission of optimizing this modern software for such low-end hardware was no doubt made easier by the Nokia 2.1's participation in Google's Android Go program, the speed at which these updates are stabilized and released over-the-air is still incredibly remarkable. 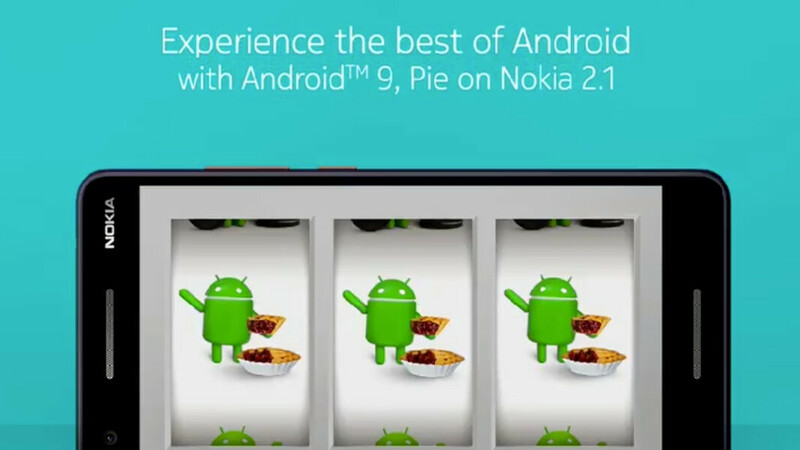 Up next, the Nokia 3.1 and 5.1 should be treated to their own Pie-flavored OS makeovers by the end of Q1, with the original Nokia 1 and Nokia 3 then scheduled for official Android 9.0 promotions sometime in "early Q2." In case you're wondering, the Nokia 2.1 is not officially available in the US. At least not under that name, as the recently released Verizon-exclusive Nokia 2V is actually pretty much identical to the "global" 2.1. Unfortunately, Big Red will have to pass the Android Pie update through its own internal testing and certification process, so you may have to wait a while until the 2V leaves Oreo behind. Don't confuse can't with won't. The S7 series can obviously handle Pie. Samsung just won't do it. Can't say enough how awesome HMD has been concerning updates. Most Android OEM's can learn from them regarding this. There goes that fallacy of Android needing plenty more RAM to operate. It's not a complete fallacy. More RAM you have, the better. Obviously this is just a forgettable foodstamp phone but that shouldn't be a literal example of what a smartphone should be. This smartphone isn't forgettable to those that need a smartphone on a budget, nor is it a "foodstamp phone", due to the updates. The updates alone mark it as something more than that. It has more relevance than yours. No need to get defensive over it, lol. Defensive, you mean like you are doing in a few articles? No, I mean like you are now and in a few other articles.